My house is dusty. Not just a little dusty but it's one of those deals where I can dust of a morning and by night time I could dust again and it irritates me that things in my craftroom get dusty. 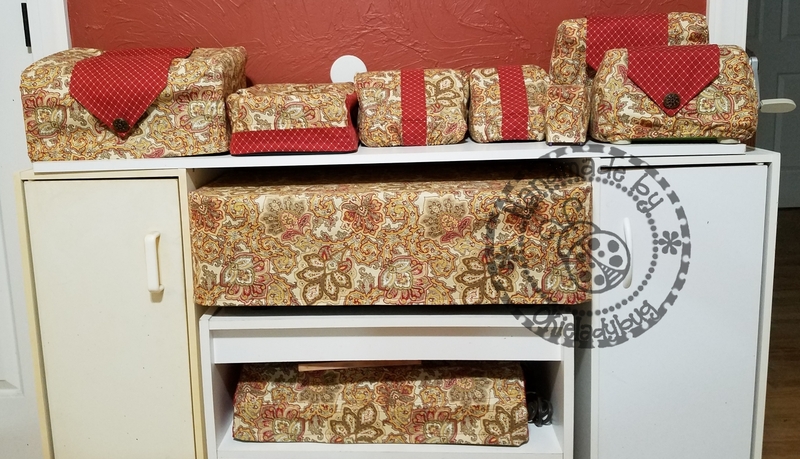 The fabric for the covers I made for myself had a different purpose when I purchased it. I was actually going to make curtains for my French Doors in the dining room but since I went the whole "Stainglass" French Doors route I was left with the fabric. 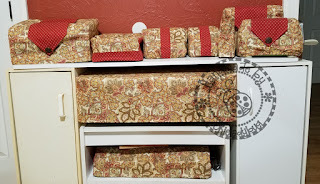 The fabric matched well in the craftroom and I opted to use it to make my dust covers. I had originally thought I would make a cover for my Explore and my Cuttlebug but then I thought about my laser printer and my Canon Pixma Pro-100 printers and figured they needed covers too. And while I was at it why not make one for my laminator as well. Somehow the whole sewing project just blew up and I ended up with covers for my Cinch and my Janome Sew Mini. I also made covers for my Xyron 5" creative station, Xyron 2.5" and even my little Xyron X. When my daughter saw the cover on the Xyron X she just looked at me and said "Really Mom? REALLYYYY?" and I told her "I had some scraps I needed to use". The hardest part about it all was making all the patterns for the different shapes but once I started I knew I had to finish. Maybe I did got overboard but I have to say that I really love all my dust covers! Great job, Shirley! I'm impressed. Are you willing to share your patterns? You are for sure the "dust cover queen." I don't see how you figured all that out, but I am in awe, LOL! What an awesome use of your fabric. No, you didn't go overboard ... OK, maybe a little ... but the results are spectacular! Your craftroom was already the best organized craftroom I've ever seen, and now with your beautifully covered tools and machines, it looks even more amazing than before. Your skills and creativity blow my mind ... another GREAT JOB! I so heart this. I'm not good with sewing but if I had a pattern i would give it a shot. Thank you for sharing pictures and the whole story.